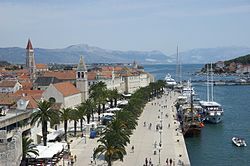 Trogir (Laitin: Tragurium; Ancient Greek: Τραγύριον, Tragyrion or Τραγούριον, Tragourion Trogkir; Italian: Traù; Hungarian: Trau) is a heestoric toun an harbour on the Adriatic coast in Split-Dalmatia Coonty, Croatir, wi a population o 10,818 (2011) an a tot municipality population o 13,260 (2011). ↑ "Polybii Historiarum reliquiae". google.gr. Retrieved 1 August 2015. ↑ "Partnerschaft mit Trogir e.V." 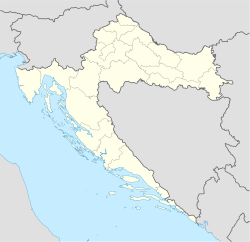 partnerschaft-vaterstetten-trogir.de. Retrieved 1 August 2015. This page wis last eeditit on 11 Mairch 2018, at 16:46.